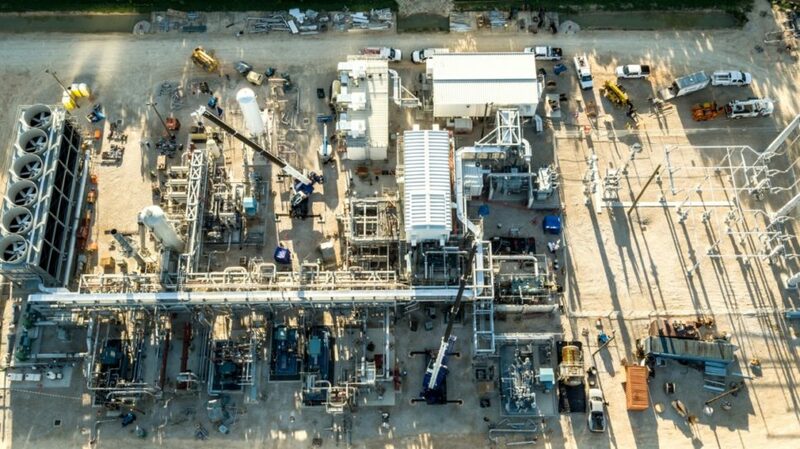 The Net Power low emissions power facility is near completion--could this be the best way to curb carbon emissions in an emissions-rich area like Houston? Work on a revolutionary zero atmospheric emission power facility is nearing completion outside of Houston, Texas. Making money off of potentially harmful emissions, how does that sound to you? It’s now possible thanks to carbon capture and storage (CCS) techniques, a solution that could help upping the game in the fight against global warming. The combustion of fossil fuels (coal, natural gas, oil), and even some renewables (biomass) lead to the formation of molecules of carbon dioxide. Carbon capture and storage (CCS) is a process to trap CO2 molecules before, during or after the combustion step in order to prevent its release into the environment. The extracted CO2 is obtained in gaseous or liquid form, which then must be stored in geological formations of the subsoil allowing its long-term sequestration. Furthermore, many research initiatives seek to convert CO2 and make it a power resource in its own right. Carbon dioxide makes up most of greenhouse gases (GHG) released into the atmosphere by human activities. Per EPA (the U.S. Environmental Protection Agency), 65% of global GHG emissions comes from carbon dioxide as a byproduct of fossil fuels refining and use, and many other industrial processes. If we could find a way to make fossil fuels carbon-neutral, and recycle waste CO2, that’s 65% less GHG in the atmosphere. With global proven reserves at 1.1 trillion tones, coal, for example, can last (at current production rates) for the next 150 years. From an economic standpoint, we can’t just quit using coal and other fossil fuels, and with the development of efficient CCS processes it’d be possible to continue using them while cutting their environmental impact. CCS, or carbon capture and storage of CO2, makes it possible to curb CO2 emissions, and help achieve the target (limiting global warming below 2°C above pre-industrial levels) set by Paris climate agreement without totally destroying the oil and gas industry. On that note, apparently U.S. President Donald Trump is reconsidering his previous decision and the U.S. may stay in the Paris climate agreement, “under the right conditions”. President Trump has called for the use of “clean coal”, although his explanation of how they would clean it was somewhat misleading. Carbon capture is a promising route towards clean fossil energy, and a new startup is breaking ground with their first demo facility. Three firms (8 Rivers Capital, Exelon and CB&I) have partnered and created Net Power, a startup that develops a technology to generate low-cost power from fossil fuels with virtually zero-emission. Rather than just building low-efficiency and expensive carbon capture add-ons, NET Power has thought about developing a whole new power cycle that inherently addresses carbon issue while still generating electricity from fossil fuels. To validate their technology in real-world conditions, NET Power has been building a natural gas power plant with electric-generation system that produces zero GHG, including CO2. Net Power, which intends to license its technology to third parties (oil and gas companies, power utilities), expects the first commercial plant to start its turbines as early as 2021. Where does Net Power’s low emission power plant rank in your list of effective means to reduce CO2 emissions?